Language can almost be considered an organism because it is always changing. The evolution of mobile phones into smartphones has revolutionised the way we communicate in the 21st century. Using pictorial symbols for words or phrases has become second nature to new generations, with emojis centre-stage as the latest tech-driven leap in human expression. 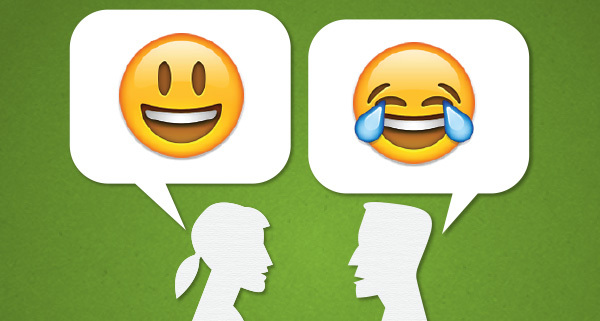 Emoji are small digital images (pictographs) used to express an idea or emotion in electronic communication and are now an integral way to connect with and understand one another. Smartphones are now preloaded with entire keyboards of emoji that can depict everything from facial emotions and floppy discs to piles of poo. If you’re unfamiliar with emoji you may be wondering how on earth people are making sense of messages like this: ? ? ? ? . Legitimate and logical messages like these are used by billions of people and have even found their way into Australian politics and international diplomacy (more about that below). Although emoji were created in 1999 in Japan, you only have to consider Egyptian hieroglyphs or indigenous Australian rock art to know that humans have been communicating through imagery for millennia. The Oxford Dictionary recently recognised the prevalent use of emoji in modern language by awarding the ‘Face with Tears of Joy’ emoji (?) the 2015 Word of the Year. But how can an image be awarded the title of word of the year? As language continues to evolve in the digital world it seems that communication is no longer limited to letters and numerals – in fact you could say we’re returning to our roots with a modern take on the hieroglyph. Talk to any child or young adult and they’ll tell you that they regularly use emoji in their mobile communication. Emoji aren’t bound to text messages anymore, they exist in video messaging in apps like Snapchat, in Facebook posts and even in advertisements. They’re used by people all over the world from all races and increasingly by people of all ages. Politicians are also more frequently using emoji to connect with audiences. In February 2016 Australian Foreign Affairs Minister Julie Bishop conducted the ‘world’s first’ political emoji interview where she answered texted questions with emoji. But the particular answer she gave to one question about Russian President Vladimir Putin kicked up a storm. Ms Bishop answered the question ‘[What do you think about] Russian President Vladimir Putin?’ with the ‘Pouting Face’ emoji (?). The response even triggered an investigation by the Australian Senate about its intended meaning in the context of international diplomacy. Ms Bishop’s answer was that she felt that particular emoji best described the persona of the Russian President. Following the episode she even went on to act out an emoji in a TV interview. Ms Bishop’s use of emoji is broader than just a method of engaging with specific audiences; it’s an example of how people are using emoji to cross language barriers and make sense of the world. The future of human communication needs to make room for pictorial messaging like emoji – partly because it’s already here and people are already using emoji as a language, but also because there’s something about using images to express oneself that creates a powerful connection between people.